Indian wooden toys games and puzzles, great return gifts for kids birthdays, are handmade by artisans of Nagina in North India. 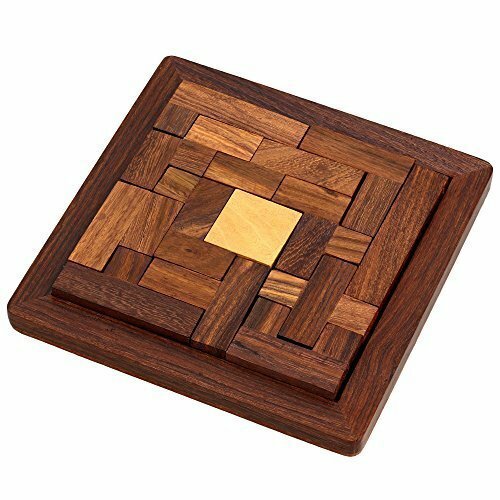 There's nothing like a puzzle game to pass the time when you're traveling, waiting for an appointment, stuck inside on a rainy day or enjoying a quiet afternoon with friends and family, and if you're looking for a unique way to enjoy the fun of a puzzle anywhere, the Handmade Indian Wood Jigsaw Puzzle is the perfect solution. This jigsaw puzzle is challenging fun for kids, teens and adults and a great choice of gift for any occasion. The Handmade Indian Wood Jigsaw Puzzle is a complete puzzle set designed for use on the go. To play the game, fit together the wooden pieces to make a finished mosaic. You can build the puzzle on top of its storage tray or on a table, and it can be used by one person or by a whole group! The finished puzzle measures 4 inches in length by 4 inches in width by .6 inch in height, while the tray measures 5 inches by 5 inches in size. Its size and light weight allows you to easily carry it anywhere! Unlike other puzzles that you'll find in stores, the Handmade Indian Wood Jigsaw Puzzle was made to stand the test of time. The pieces are all constructed from solid Indian sheesham hardwood, not flimsy cardboard or plastic. The handsome grain of the natural wood makes this game as much of a decorative item as it is a challenging, fun toy. As a result, you can leave it assembled in a game room or den. It's even great to keep on a desk in an office, on a table in a waiting room or a shelf inside of a coffee shop or cafe. No matter where you use it or display it, you're sure to be impressed with the Indian handcraftsmanship. Get the perfect travel game to keep you or your kids entertained wherever you go or give the gift of a toy that is of much finer quality that anything you'll find in stores.